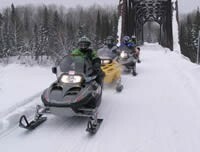 As a snowmobiler in Ontario, Canada we’re faced with all types of winter weather. Our sport takes us to some of the most remote places in this country and challenges both us and our machines against the elements in our wilderness playgrounds. Throughout my 25 years of riding experience I’ve had the opportunity to ride in all types of conditions, from the extreme cold of the remote north to sunny blue birds spring days and everything in between including the pouring rain – soup to nuts as they say. My riding experience has also provided with me hours of seat time across all rider segments. I’ve spent countless days riding hundreds of kilometers by trail, hour upon hour of time at the track as well as countless body draining days in the backcountry shredding powder, navigating climbs and of course getting stuck. My riding resume is long and diverse and until now I had never found gear that worked well throughout all segments. I had previously wore gear suited to the extreme cold of the north and it worked well, but when I or the temperature warmed up this gear became heavy, uncomfortable and in some cases threatened my riding enjoyment. 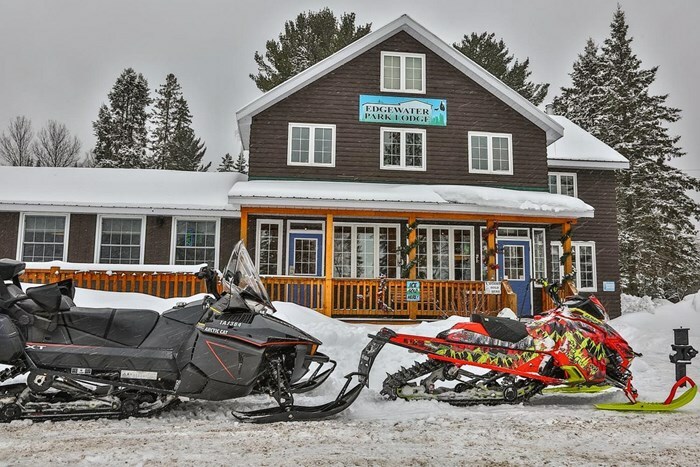 Just over a year ago I had the opportunity to try KLim's lineup of gear and I’m pleased to report that I’ve finally found what I believe could be the ideal set up for snowmobiling in most of Canada. In this article I’m going to take you from the bottom up explaining why each piece of their gear is optimal for riding in Canada. For this particular test, I rode all across Northeastern Ontario – Temiskaming Shores, Sudbury, and my home region in Mattawa. Hitting all of these areas gave us a chance not only to ride incredibly well groomed trails every day, but to experience a pretty wide range of riding to test the gear; tight twisty trails, wide open lakes, and even some backcountry riding in open areas. A ride isn’t enjoyable with wet or cold feet, being uncomfortable effects performance and as a rider I need to have footwear that works as hard as I do. I started with the Klim Sock which is designed to wick moisture as well as keep you warm with its 31% Merino wool. This sock is the perfect hybrid sock, it’s long and pulls high up your shin and functions perfectly with KLiMs GORE-TEX boots. KliM’s Adrenaline GTX BOA boot takes comfort and performance to a new level. For years I wore your standard snowmobile boot, it worked well for riding trails but provided little to no support when riding rough moguls or the backcountry. I then switched to a snowboard style boot, it provided ample support for on the track and off the ramps but was less than ideal for cold conditions. In addition to less than ideal performance in cold conditions I found my feet tired and my shins sore after a day’s ride. Both the standard style snowmobile boot and snowboard type boot never stood up to the thrashing they received and quickly deteriorated comprising the boot. Everything changed when I put on the Adrenaline GTX BOA boot – my first impression was how comfortable it was –it was like your feet were wrapped in Canada goose down pillows, secondly I noticed how I was able to dial in the desired support level with the dual BOA systems – tight and snug providing great support or loose for added movement. Finally after more than a season of testing in all types of conditions and riding style I have to commend KLiM on the warmth, water resistance and durability. I now use my old boots for snow blowing the driveway. It always amazes me how many of us wear a pair of blue jeans or cotton track pants as a base layer. Proper base layering is critical to your comfort and performance as well as your gears performance. I combined the Everest base layer Pants with the Vector insulated Pants. What’s so great about this combination is that it works incredibly well together. I immediately felt lighter and more nimble than before and when it got extremely cold I was still warm without 5 pairs of long johns. The Vector insulated pants has GORE TEX three layer performance shell that keeps you dry as well as the perfect amount of 3M Thinsulate insulation to keep you warm. What stood out the most for me were the following two features, the location of the temperature control vents in the thigh area was a genius idea and allowed me to quickly open and close these vents to control my comfort level. The second feature was the 1682 ballistic panels over the knees and in the seat, this added protection defends against not only the cold but the knocks, bangs and brushes with everything from your sled to sticks. 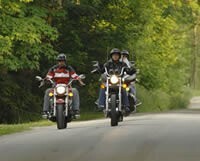 Again, it always blows me away with how many riders slap on the t-shirt and a cotton hoody as their base layer and head out riding – you’re missing out. You need to get the layering right for optimal performance and comfort. I started off with the Aggressor Shirt 2.0 and then the Keweenaw Parka – I’ve never been warmer and more comfortable. This combo is wicked light, the weight reduction over other jackets is noticeable especially after riding all day. What I especially appreciate it the ease of mobility without sacrificing comfort and warmth – KliM utilizes six different types of 3M THINSULATE Platinum series insulation in this jacket including one layer that is silver lined with anti-microbial insulation. All of these materials are super durable, washable and will stand up to the abuse they will receive on your riding adventures. I’ve had the chance to try three different pairs of KLiM’s gloves and each one impressed me. The first is the Fusion glove. What stands out most about this glove is the ability to essentially have two gloves in one, the Fusion has both a ‘grip and ‘warm’ chamber within the glove – simply slip your hand into either chamber to dial in for the riding conditions. The second pair of gloves was the Inversion glove, this glove is light weight and provides bunch free comfortable grip and is best suited for warmer conditions. Finally I tried the PowerXcross insulated glove and was so pleased with this design that I bought two pairs and wore them all winter in all types of conditions. What stands out most about the PowerXcross glove is the Gore grip technology in the palm – the palm grip surface and interior insulation are all one resulting in no separation between the layers and the best grip between you and your handle bars that will find. To my knowledge there is no other glove like this on the market, if you’re into backcountry, mountain, snow-cross or even intense trail riding you need to try this glove – I’m convinced once you ride with a pair this will be your glove of choice. Visibility, safety, warmth and breath-ability are major factors when choosing a helmet set up. With Canada’s diverse riding opportunities I’ve yet to find a headgear setup that is suitable in all conditions and riding styles. 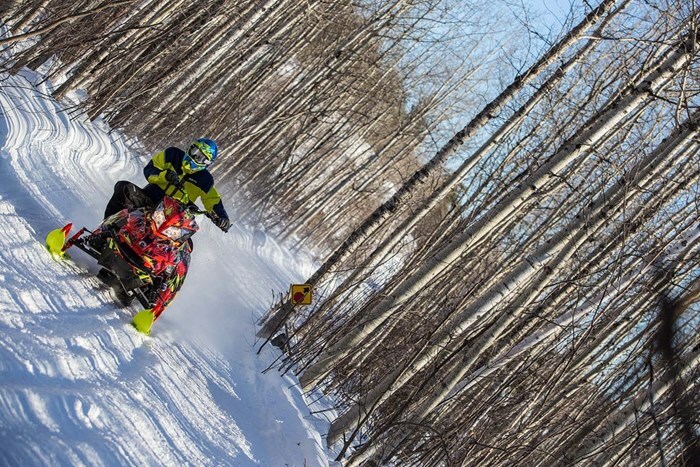 I’ve had the chance to try two different KLiM balaclava’s the Arctic and the Covert. Both of these balaclavas work exceptionally well in all types of conditions and provide superior comfort and wind protection. The KLiM F4 helmet utilizes a combination of aerospace fiberglass, carbon fiber and Kevlar layers to ensure all safety standards are exceed. One of the best advantages of this helmet is its ventilation capabilities offering superior cooling and moisture wicking over many other brands. For riders who participate in backcountry riding this helmet works incredibly well, its light weight and multipurpose four season attributes make it ideal for the rider who partakes in multiple motorsports activities. The F4 however does lack the warmth and wind resistant design of competitor helmets and is not recommended by me for anything colder than -15c, in addition the F4 does not perform well at high speeds (100kph+) as I found that the increased ventilation, goggle fit and seal needed improvement for the trail rider or those of us who ride extreme cold conditions. That being said as noted above this helmet set-up preforms exceptionally well in the backcountry and lower speeds. 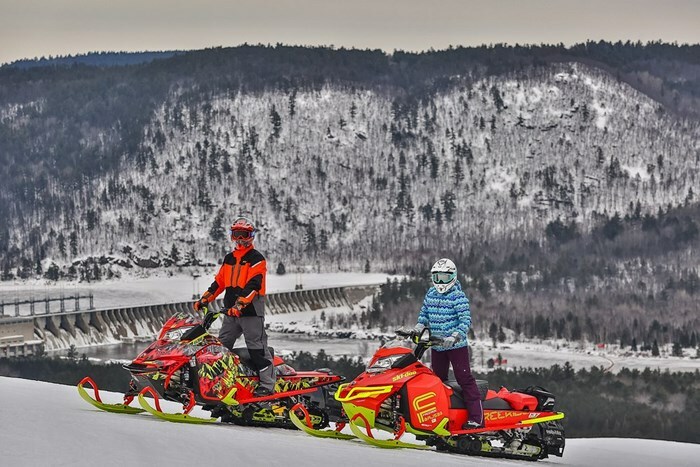 There you have it, this is an honest grassroots review of a complete KliM gear set-up. 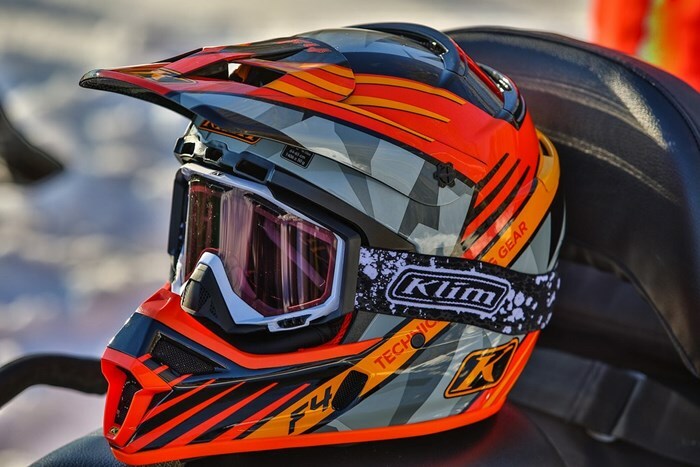 If you’re shopping for new gear I think you will agree that KLiM’s product line is worth a good look.